Archaeological excavation, architectural survey and historical research carried out between 1978 and 1993 have elucidated the origins and early development of Wells Cathedral. Study concentrated primarily on the cloister and its adjuncts, and excavation took place in the adjoining ‘Camery’ garden. Here lay an ancient cemetery and the foundations of a succession of demolished buildings, ranging in date from Roman to post-medieval. Collectively, these enshrined a continuous development of religious and sepulchral activity, probably from the fourth to the mid-sixteenth century; secular uses followed. Adjacent to the Camery are the springs from which Wells takes its name. The first mention of the ‘holy well’ and minster church of St Andrew is in A.D. 766. Excavation yielded a complex stratigraphic sequence, demonstrating how an anonymous late Roman mausoleum burial probably provided the raison d’être for the development of a Middle Saxon cemetery and chapel, and hence for the origins of Wells Cathedral itself in 909. 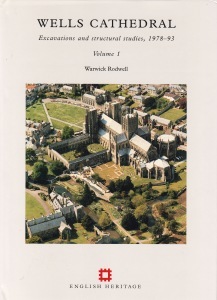 The establishment of this sequence is uniquely important in the history of English cathedral archaeology and sets Wells alongside developments in continental Europe.